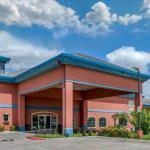 La Copa Inn located in Mercedes, Texas, offers free shuttle services to the Rio Grande Valley Premium Outlets Mall. Free Wi-Fi is available in every guest room. At the La Copa Inn Mercedes, each room provides a coffee maker for guest convenience. Additional amenities include a hairdryer and an in-room safe. The Mercedes La Copa Inn features an outdoor pool. The hotel offers a daily hot breakfast and a 24-hour front desk. The Santa Ana National Wildlife Refuge is 21 miles from the La Copa Inn. The Llano Grande Golf Course is 5 miles away..
We plan to add more related stuff like: pet friendly hotels in Mercedes, Texas dog friendly hotels in Mercedes, dog parks in Mercedes, pet stores in Mercedes, TX, and pet spas in Mercedes. Keep checking for more!